If you’ve been looking for a new Honda or used vehicle, it’s important that you purchase a vehicle from a dealership that you can rely on. Owning a vehicle goes beyond the initial purchase and includes parts, services and so on. 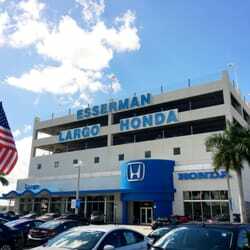 On top of putting you above all else, Largo Honda will provide you with excellent customer service to make sure that you—the customer—are in mind. Whether you’re looking for a new Honda, Certified Pre-Owned Honda, or another pre-owned vehicle, our sales staff can assist you in every way possible. Our amazing sales team will aid you in finding the perfect vehicle that suits your driving tastes, budget and lifestyle. Our dealership carries the entire Honda lineup, so visit our dealership to get our best price on a Honda and a first-class experience. If you’re not looking for a new Honda, but are interested in saving money on a vehicle with a pre-owned Honda, then our dealership is delighted to help. We carry an amazing assortment of used Hondas in stock at Largo Honda. We offer a variety of high-quality used vehicles from a wide array of other auto brands. If you’re interested in saving money, but are worried about the reliability of a pre-owned vehicle, then check out our Certified Pre-Owned Hondas that are backed by an extensive warranty and are restored to factory standards. At Largo Honda’s Service Center, we know that your Honda means a lot to you. We have a high-tech center that allows us to maintain and repair your Honda. Even if you didn’t purchase your Honda at Largo Honda, we’re more than happy to maintain and service your investment. Our factory-trained professionals can manage all of your Honda’s needs including warranty repairs, major repairs, routine maintenance and more. Our service department’s goal is to get your Honda back on Florida’s roads in excellent shape and in a timely manner. To schedule your next service, you can complete an online appointment form or call our service advisors that will assist you in finding a time and day that works for you. If you prefer to service your own Honda, our dealership has a well-stocked Parts Department that carries genuine OEM components and will assist you in getting the proper parts for the repair. You can also explore Largo Honda’s online Parts Center to find the right parts by your Honda’s make, model and trim. If you need any help in finding the right parts, then give our Parts Department a call and let our helpful staff aid you in getting the right components. At Largo Honda, getting financing for your next new, pre-owned or Certified Pre-Owned Honda is a breeze. Our amazing Finance Department will aid you throughout the entire finance process and will make getting into a Honda an easy task. Whether you have bad credit, good credit, or no credit, we have an auto loan program that involves multiple lenders to get you an outstanding loan. To make the finance process faster, explore Largo Honda’s website and fill out a secure online finance application. Within minutes of filling out the application, you’ll be able to see your loan options and can rest assured knowing that Largo Honda’s Finance Team is working tirelessly to get you hassle-free rates and terms on your next Honda. If you’re preparing to get a Honda in the near future, then visit Largo Honda where affordable vehicles and excellent service go hand in hand. Our dealership is here to serve all of Florida City, FL’s Honda customers with years of excellent vehicles and a hassle-free car-buying experience for all.